The University of Illinois at Chicago has received a $500,000, five-year grant from the National Science Foundation to support the Center for Advanced Design and Manufacturing of Integrated Microfluidics. The center, also known by its initials CADMIM, has two sites — one at UIC and another at the University of California, Irvine — and focuses on developing miniature devices that can perform biochemical analytical functions quickly and cheaply. These devices can be used to do things like rapidly detect dangerous toxins in the blood, quickly screen hundreds of potential drugs, isolate cells for in cancer diagnostics and treatment, or provide information on plant health that can be used to improve crop outputs. 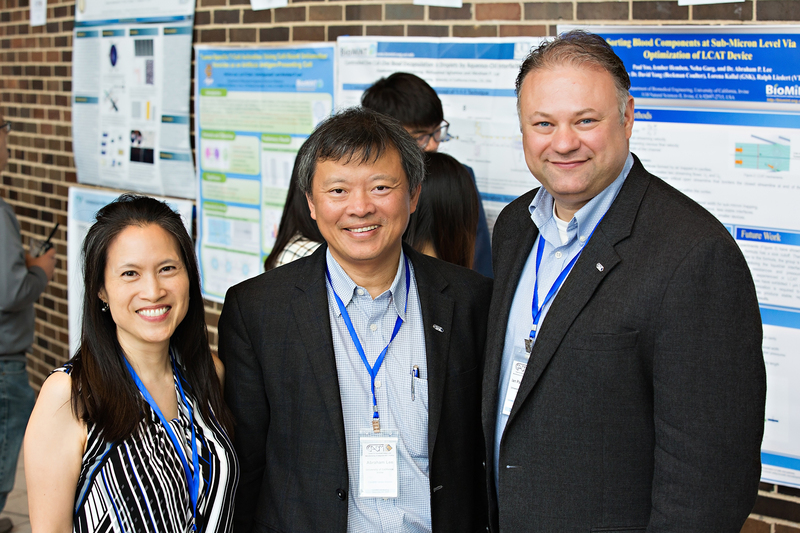 The core CADMIM team: Gisela Lin and Abe Lee of UC Irvine and Ian Papautsky (right) of UIC. The UIC site has expertise in microfluidics, cell separations, 3D printing and point-of-care sensors, as well as in creating tiny living model “organ-on-a-chip” systems. The total funding for the two-site center is $1.25 million, and is a second phase of investment in the CADMIM, which launched five years ago with a $836,000 grant from the NSF. “It is gratifying to know that the National Science Foundation is recognizing and rewarding the many accomplishments of CADMIM in the first five years, in research, in technology transfer, and most importantly, in building a community of students, faculty and industrial members that bridges advanced research with real-world applications,” said Abe Lee, the William J. Link Professor and chair of biomedical engineering at UC Irvine and its CADMIM director. CADMIM is funded through the NSF’s Industry-University Cooperative Research Centers program, which fosters long-term partnerships among academia, industry and government in various technology sectors. The center has worked with several industry leaders over the last five years, including Procter & Gamble, Beckman Coulter, KWS, Monsanto, QIAGEN, ThermoFisher Scientific, Canon U.S. Life Sciences, GSK, Genomics Institute of the Novartis Research Foundation, Douglas Scientific, Amgen Inc., Genentech Inc., Corning Inc., Los Alamos National Laboratories and Air Force Research Labs. CADMIM industry partners provide funding for university researchers to develop solutions for specific needs or problems. UIC and UC Irvine CADMIM researchers working with GSK, are developing a human liver culture platform using induced pluripotent stem cell technology that can be used to screen thousands of compounds in early drug discovery using a sustainable and genetically-diverse source of patient-specific cells. “Ultimately, this platform can be used to mitigate the risk of drug toxicity to patients in the clinic, as well as develop novel therapeutics against global human liver diseases such as hepatitis B viral infection, non-alcoholic fatty liver disease and hepatocellular carcinoma,” said Salman Khetani, associate professor of bioengineering at UIC and a lead researcher on the liver project. In another project, working with KWS, a German company focused on plant breeding, UIC CADMIM researchers are creating sensors that would be “worn” by plants to provide information on plant hydration and fertilization. “This sensor was created so that growers could get a better handle on the health of their plants so they could make informed adjustments to watering or nutrition for better crop yield,” Papautsky said. Other UIC projects have produced point-of-care sensors that can help health care providers quickly determine blood lead and manganese levels in the field and “micro livers” that can be used to test drug toxicity before clinical trials in humans. David Eddington and Jie Xu from the University of Illinois at Chicago and Elliot Hui, Jered Haun, Michelle Khine and Michelle Digman from UC Irvine, are other key researchers in CADMIM.